Martin Luther was a musical man and as a child he was in a boys’ choir. I am happy to also report that he was a flautist, just like me. He is well known as the author of many hymns and even published his first hymnal in 1524. Perhaps Martin Luther was most famously known as the German Monk who became intolerant of the Roman Catholic Church over teachings on the subjects of clerical celibacy, papal abuses, the denying of the scriptures, sainthood, salvation by works, and other Catholic doctrines. 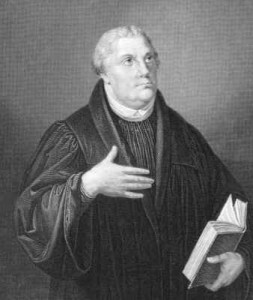 In 1521 Luther was excommunicated from the church when he refused to recant his teachings which were against what the Catholic Church taught. Luther asked the Papal Legate to show him “scripture and right reason” or he would not, nor could not recant. It was a very serious offense for which he was forced to go into hiding. No doubt Martin Luther did a lot of teaching and preaching; he has said some amazing things. Take a look at these other powerful sayings and quotes from Martin Luther. Interested in more quotes and sayings? Thank you, I truly enjoyed reading this article. I have heard so many preachers quote from Martin Luther , this was interesting to me , I had never actually put it together where the name Lutherans had came from . I have attended a Baptist Church most of my life , and I know John The Baptist always said one greater than I is coming , and he was just setting the way for him . He felt uneasy about baptizing Jesus also of course , and he like others went through a time where you knew he was not perfect . I’ve seen where so many chosen men are in the Bible , and each is seen for their fleshly ways some time during their life , all for the exception of Jesus . surely Am much inspired with your calling! your are the vessel of blessings to desperate kid s and to me you are my source of theological Knowledge for through your web am able to do research paper about Martin Luther. Greetings MRS Williams from Quemado ,New Mexico. I Go their A few times each year one of my sons daughter in law and grand kids live in Rio Rancho..
Just read your whole article about Martin Luther and enjoyed it.. he did how ever finally started using the name Lutheran him self yet you Propably know those quotes.. Luther no longer fearing it would be used wrongly .. he taught us well The meaning of the first commandment .. and how only Jesus lived up to it perfectly ..
their a song on how God does that. and a Luther quote that inspired it. ON YOU TUBE can be googled easily if you want to hear it and see the songs SHORT video that has the Luther quote.